There’s more than a hint of Alien: Isolation about Resident Evil VII, the upcoming sequel to Capcom’s classic survival horror series. Not only is it first-person, but you’ll also be creeping through cramped spaces as an unkillable threat stalks after you. Don’t let a new release sneak up on you with our upcoming PC games list. 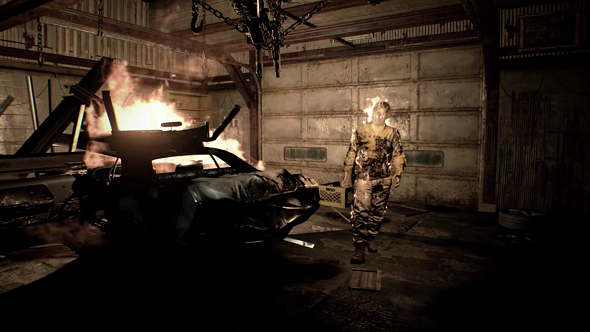 Here the threat seems more human, coming in the form of one of a redneck stomping through the corridors after you, but even a bullet to the head won’t stop this psychotic murderer, as you can see in the trailers Capcom have just released. The footage actually reminds me a bit of the Nemesis from Resident Evil 3 – especially when he crashes through a wall to cut you off. The rest of the trailers show off short cuts of other gameplay, which seems to be made up of answering phones, shooting black gloop monsters, creeping up on wheelchair-using old ladies and trying to hide in a house where there’s nowhere to hide. Resident Evil VII releases on January 24 and there’s a demo out on December 19.